1. Take a deep pan and fill it with about 4-5 inches of water. Let the water simmer until there are steadily breaking bubbles on the surface then add a splash of white wine vinegar. Break an egg into a ramekin or cup and pour it slowly into the water, white first. The with a spatula give the egg a gentle push to prevent it from sticking to the bottom of the pan. 1. Bring the milk to a near boil and whisk in the roux. Add salt and thicken with the roux. Melt the butter in a saucepan over low heat, being careful not to let it brown. Cook for about 4 minutes, keeping in mind that the resulting roux should be golden in color. 1. While the Bechamel sauce is still warm mix in 1 cup of graded cheese to make it into Mornay sauce. 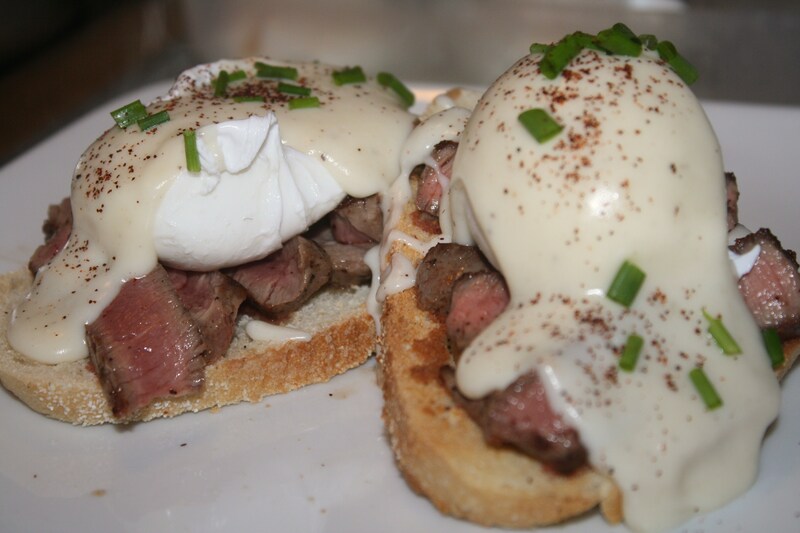 Dollop on top of the poached eggs and serve. Excellent choice of nursery rhyme to go with the Poached Eggs Mornay recipe. They look amazing topping the beef on the crostini. As ever, a feast for the mind and the eyes. Great post, Eric.